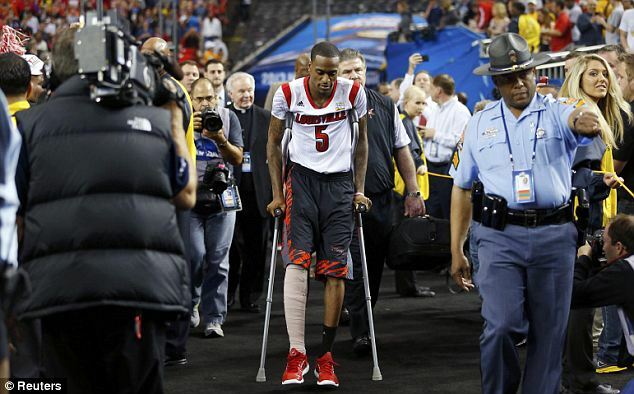 Louisville Cardinal basketball guard Kevin Ware shattered his leg in a freak accident during the NCAA regional championship game at the end of March. On that fateful Sunday night the sophomore player leaped into the air to contest a three-point shot and when he landed, his tibia broke on impact and shot a piece of the bone through his shin. Following the gruesome injury, Ware underwent a successful surgery to reset the broken bone. His bone was set and a rod was inserted into the right tibia in order to stabilize the bone while it heals. Just hours after the surgery, Ware, continuing to remain positive was carefully walking and telling his teammates to “win the game.” Of course, they did, and went on to capture the ultimate prize, winning the National Championship on Monday night, April 8. Ware seemed to give his team the spark they needed to take it all, and his positive attitude will go a long way in recovering from the injury as well. Despite the severity of his injury, as the athlete is relatively healthy and young, his recovery is expected to be long but he still may be able to get out on the court in his junior year. For someone healthy, it could take anywhere from three to six months to recover, with athlete diets playing a key role in that recovery process. A healthy, balanced diet is crucial in order to rebuild muscle and bone as well as damaged tissues. Including plenty of whole, fresh organic foods as well as those packed with anti-oxidants like dark leafy greens and vividly colored fruits and vegetables like carrots and berries in athlete diets can help boost the immune system and speed recovery. Creatine, a natural compound made within the body, can determine how quickly those muscles and damaged tissues can regenerate. Studies have shown that supplementing with creatine can enhance skeletal muscle regeneration and protection. Athlete diets that include creatine were proven to shorten recovery time, helping muscles recuperate faster, making it especially beneficial for athletes with sports injuries to get back to their game as quickly as possible. For Kevin Ware, he’s likely to have a team of health experts making sure he gets the proper diet, including creatine, and with his positive attitude the odds increase that he’ll be back on the court early next season. The post Basketball player Kevin Ware Stays Positive as he Recovers from Devastating Leg Injury appeared first on Nashua Nutrition Blog.